For years, I have enjoyed making smoothies. There are many I enjoy, but I often return to my favorite smoothie which has a chocolate base and is a healthier way to satisfy my never-ending sweet tooth. Although I like my greens, NEVER did I have any inclination to put them in the blender. Until recently. I was all set to make an apple-cinnamon version of my first make-ahead smoothie, which relies on blended oats and chia seeds, instead of frozen fruit or ice, to create a wonderful thickness. Earlier that morning, however, I ran into a friend who mentioned that she drinks green smoothies every day. She actually looks forward to them! She mentioned how avocados create the most velvety texture, and that she loves how peanut butter works with the avocado. Hmmm, I thought as I stood over the blender. Maybe this was my day to take a leap. So, out to my garden I went and plucked some kale leaves. I had a ripe avocado and I always have peanut butter. I knew I wanted the smoothie to taste sweet and definitely not, well, green. Instead of using the Granny Smith apple I had planned on, I grabbed a sweet Fuji apple. After a little experimentation, I ended up with a combination that I enjoy so much, I have made it over and over. Initially, I used half an apple, peeled. Now I use the whole apple, cored, but with the skin on. I’ve upped the amount of kale a bit and, with the full apple, the yield now exceeds my serving container of choice–a 16-ounce Mason jar. The yield is closer to 20 ounces. If you like this smoothie, double the recipe to have three good-sized servings. You can freeze them, if desired, although they will keep several days in the fridge. I also like to take an extra dollop of the vanilla Greek yogurt and spoon it in, just before eating. It’s like whipped cream but better. Really. I have a few other flavors I’ve been thinking about, but I seem to keep going back to this crazy green concoction which tastes so surprisingly good! Note: I added no sweetener beyond the vanilla yogurt and the natural sweetness of the apple. With smoothies in general, how much sweetener you will want add will depend on how sweet your fruit is to begin with, which type of milk and yogurt you use, as well as personal preference. Protein powder can be a source of sweetness, too, if you opt to include that. Adjust to your taste preference. Keep in mind that the flavors will develop a bit as the smoothie sits in the refrigerator. Follow THIS LINK for a great strawberry option. Add the oats and chia seeds to the blender, and blend on high until you have the texture of a fine flour. Add the milk, yogurt, and all remaining ingredients. Blend on high until the mixture is smooth, scraping down the sides and blending again, as necessary. It is helpful to stir down to the bottom to make sure the oat mixture is fully incorporated. 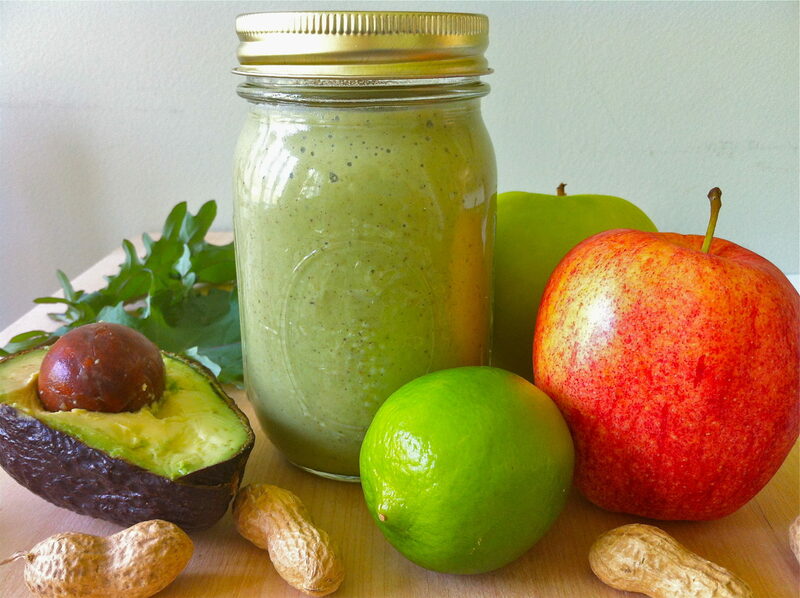 Transfer the smoothie to a jar or other lidded container. Refrigerate overnight and shake before drinking. Will keep 2-3 days in the refrigerator. If you want to freeze, first allow the mixture to soak for at least four hours in the refrigerator. This recipe has been shared with Amee’s Savory Dish and her collection of Fit and Fabulous recipes. You are welcome, Amee! There are always so many good things to be found on Fit and Fab! Hi Ann! I bought an avocado to try this. Neither my husband or myself are fans of guacamole.. And I know how avocados are such a super food, so I am going to making one this morning for later in the day. No kale on hand but I do have spinach, which I started using in smoothies last year and love! I will be curious to read what you think, Mary Lou! Your timing is perfect as I was just thinking this morning that I haven’t made a smoothie in a while. I was actually planning on making this one…my avocado just needs to ripen a bit! I just might get my husband to like this one. I tasted apple, cinnamon and peanut butter primarily. I need to get some kale to try also. That would be great! It is amazing how the veggies get disguised!